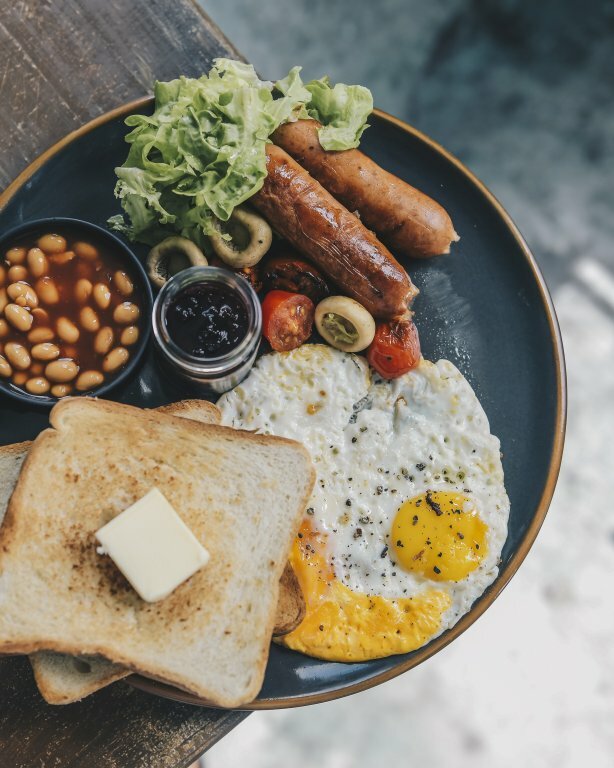 Kavarna burst into the food scene with a bang and is one of the café’s that really shaped the Hulhumale’ food scene. People loved the small bistro style menu, the artistic ambiance, and mostly, the delicious slow cooked food. But who was behind the scenes? Who was putting together this amazing menu? Meet Naju Rachey. On a breezy evening, we sit outside Kavarna to have a chat with Naju over dinner. We’re met with a friendly face, someone who had a story to tell. Naju’s first memories of food takes her back to her childhood in her grandmother’s kitchen. She tells us of her grandmother who’s an amazing home cook, and quite possibly her biggest inspiration. The first cooking experience Naju had was making banana fritters. Spoiler alert! She isn’t the biggest dessert fan. After finishing high school, her father took her out for a coffee one day and asked her point blank, what is it that she wanted to do. This was a time when everyone around Naju was encouraging her to be an accountant. But she shared with her father her interest in cooking and with his encouragement, started her journey into culinary school. It’s not for everyone, she tells us. You have to have a true passion for food and cooking to survive culinary school and later on, survive the industry. After coming back to Male’, Naju worked in some resorts including Four Seasons and Bandos Island Resort. This could be described as her formative years when she truly experienced the good and ugly side of working in a kitchen. At a time when there weren’t even a handful of women working in the hospitality and culinary industry, Naju faced many challenges in the resort environment. But for her, this was still a time that helped to form her career in the industry. Testing new dishes, creating stories with her food, giving people Instagram-worthy food to talk about, consulting for restaurant owners and creating their menus; this is where Naju’s true passion lay. 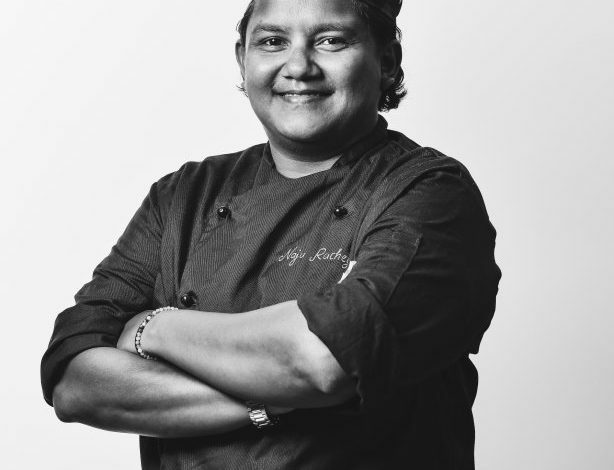 She fondly remembers the first Cajun inspired dish on the menu that she created for Seagull, one of the pioneers in the Male’ food industry and a true veteran when we talk about introducing fusion food to Maldives. From there on, she started to consult and create menus for different restaurants. The creation of the menu at Blue Bay was a highlight for Naju for many reasons. She shares with us about her experiments with mixing fruit drinks, and how the teams at some of the bigger restaurants in Male’ would visit Blue Bay and try out the drinks. 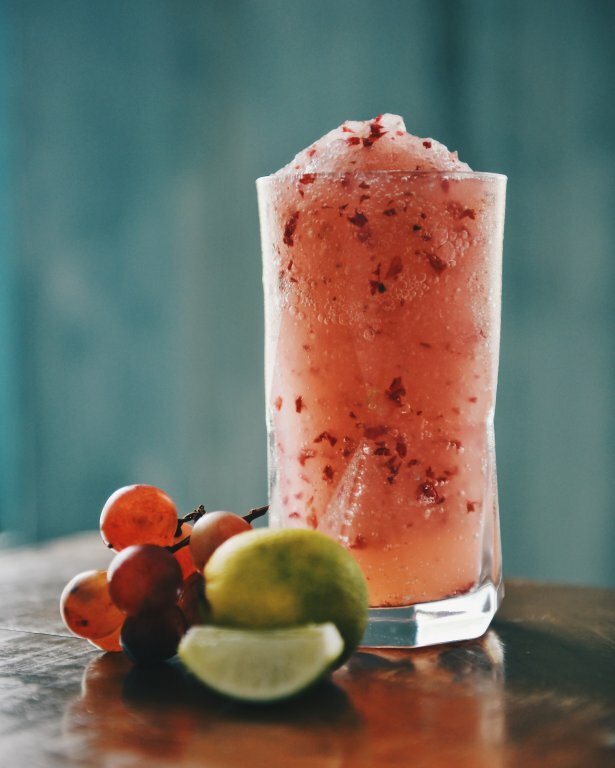 For her, the biggest compliment was when she visited those restaurants and started seeing similar drinks on the menu, inspired by her own work at Blue Bay. Gourmet was another project that Naju took on when they first opened in Male’, after which she developed the menu at Café Lyre in Hulhumale’. 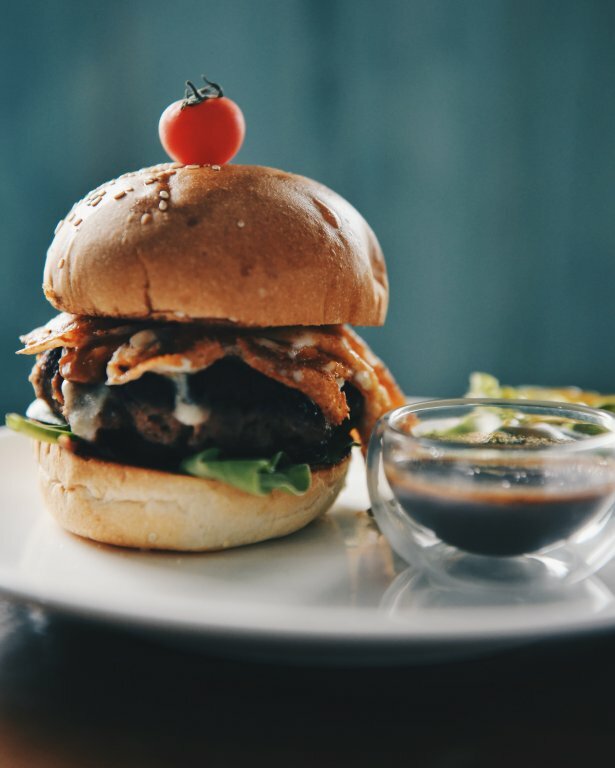 The signature “Bodu Golaa” and “Kuda Golaa” burger at Café Lyre is a gimmicky invention of Naju’s that many people claim is the best burger in town. She tells us that there is a trick to finish the gigantic burger within the time limit given in the challenge to claim it for free, but doesn’t divulge her secret to us. By this point of the conversation, we had finished the rich beef stew and creamy chicken spaghetti. 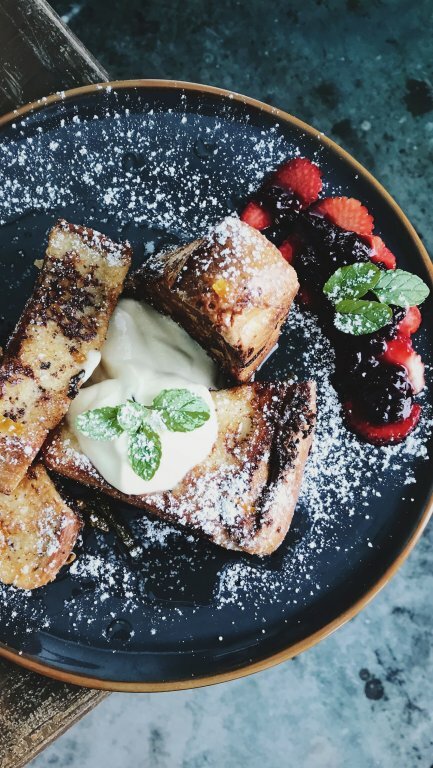 With Naju’s recommendation, we dig into her Pain Perdu, a rich French toast with homemade passion fruit curd that was recently introduced to the menu. This brings us to how Naju came about to create the menu at Kavarna. She tells us about the owners of Kavarna and their vision for the café. They truly wanted to create something different, and gave Naju the creative reins when it came to the kitchen side of things. She gives the owners a lot of credit for the success of Kavarna, because without the freedom that she’s being given to run the kitchen, it wouldn’t have become such a fast success story. Many of Naju’s dishes are what she loves to eat. Tried and tested with her family, friends and loved ones. From signature elements like the home-made jam and her famous hot sauce, Naju’s personality can been seen through Kavarna’s menu. She shares with us one ingredient that goes into her hot sauce, and that’s coffee. The rest of the process is a carefully guarded secret that she doesn’t plan to share with anyone just yet. For Naju, the biggest satisfaction in her line of works comes from the reaction of happy customers who shares a good word or two on social media, from other restaurants that are inspired by her food, and from young Maldivian that want to enter the field after working together with her. It’s not easy to manage an F&B team here in the Maldives. There are many challenges that Naju faced when working with different people, but the amazing thing is that she’s so willing to give a second, third and even fourth chance to people who want to pursue work. She’s happy to mentor people who’re respectful of others, mindful of showing up to work on time, and who’re just eager to work hard. For her, it doesn’t matter whether you have zero experience in serving a coffee cup. It can all be learned on the job, and a positive attitude is the only pre-requisite you need. Speaking of recognition and respect in the food industry, Naju hopes for change. Even though young individuals and more women are emerging in the serving and cooking scene, she feels that we have a long way to go to get the deserving recognition and to be offered a space that everyone can explore their creative skills freely. 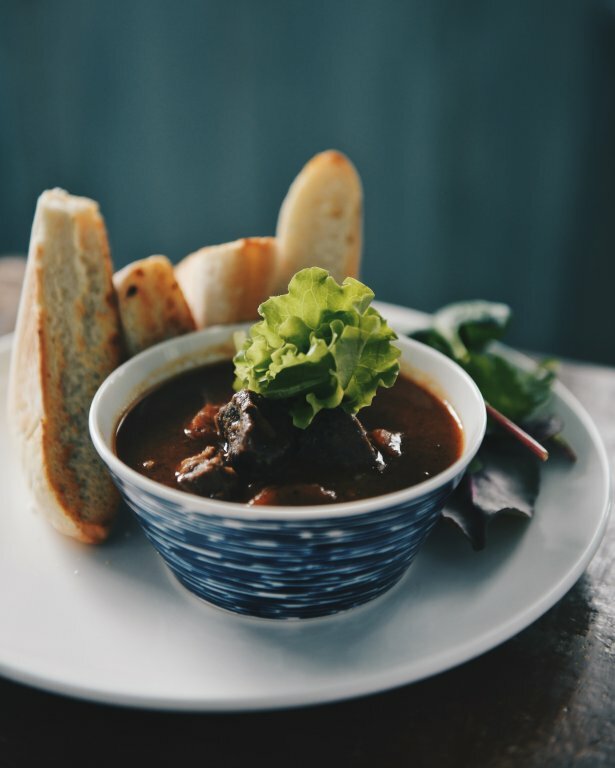 Naju is still looking forward to the day when all restaurants can work hand in hand without price wars, get inspiration from each other to come up with individual dishes, and gather as one big family to offer a fun environment for the community. From the customers, she wishes for respect to servers, chefs and everyone else who is involved in bringing food to the table, respect for people who work hard to please the customers, and an overall change of perspective when it comes to trying out new food, sharing feedback whether it’s positive or to change something for the better. And for herself? Naju considers herself to be extremely lucky. Surrounded by her family who has been supportive since day one. Being able to work with Kavarna, a café’ that has truly turned into her passion project. Of getting to mentor so many young faces, some of whom are now enrolled in culinary school. And mostly, she considers herself to be lucky because of her husband Belle. A man who Naju tells us is her rock, who encourages her to keep going every day. The person who’s her constant in life and is ready to whip up something delicious when she’s home after a tiring day. And what does the future have in store for her? Kavarna is still a part of it but Naju also dreams of bigger projects. Maybe a place that is her own? Settling down on an island that isn’t Male’? Baking a lot of bread? Coming up with even more diverse menus? Wherever life takes her, you can expect Naju to continue being around food. For us, it was an absolute pleasure to meet this strong woman who’s behind the scenes so much that not a lot of people are aware of her work even when they’re seated at the table eating her creations. Here’s to Naju, and many more of her food escapades in the future!